Given the margin pressure producers are facing again in 2016, fertilizer has been a hot topic. In addition to watching prices slide lower through the winter, producers are also likely to evaluate alternative sources of fertilizer, especially nitrogen. In this week’s post we take a look the historic use of various fertilizer sources and what the implications might be in the coming years. The sources of nitrogen that producers use have shifted over time. 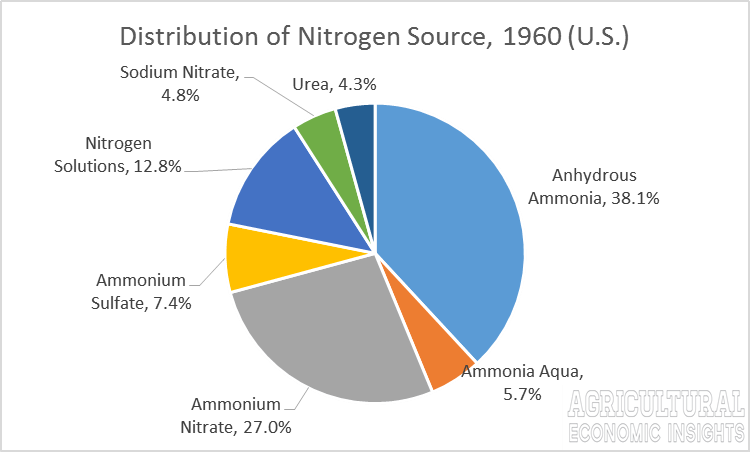 In the 1960s (figure 1) the largest sources of agricultural nitrogen were anhydrous ammonia (38% of total pounds of nitrogen), ammonium nitrate (27%) and nitrogen solutions (12.8%). Figure 1. Distribution of Nitrogen Sources in 1960 for the U.S. – reported as pounds of nitrogen. “Other Sources” not included. Data from USDA ERS. Most recently, 2011 (most current available data), the data show a dramatic shift in nitrogen sources (Figure 2). Anhydrous ammonia lost a small share of the market and now accounts for nearly 34% of total pounds of nitrogen. Ammonium nitrate, the second largest source in 1960, currently accounts for only 3% the market. Nitrogen solutions (such as 28% and 32%) have gaining in popularity and currently account for one-third of nitrogen usage. Urea had the most significant gains in the industry and now accounts for more than 27% of total nitrogen applied; a huge increase from the smallest reported source of nitrogen in 1960 at 4% of the market. Figure 2. 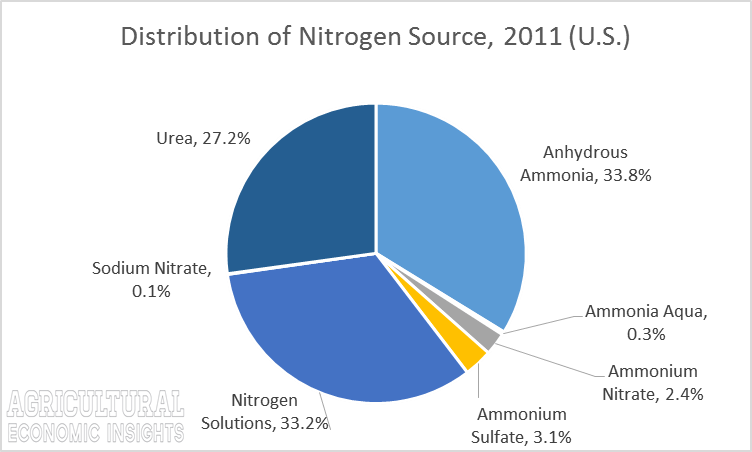 Distribution of Nitrogen Sources in 2011 for the U.S. – reported as pounds of nitrogen. “Other Sources” not included. Data from USDA ERS. The share of the total market a single fertilizer product represents can be difficult to compare at two points in time, especially as the size of the nitrogen fertilizer market changes. In figure 3, the total tons of each individual material used is shown. A couple key-trends are visible. Prior to the mid-1970s, nearly the same tons of anhydrous ammonia, nitrogen solutions, and ammonium nitrate were used. However, a divergence began around in 1975 as the use of nitrogen solutions has increased, ammonium nitrate contracted, and anhydrous ammonia remained mostly flat. In fact, current anhydrous ammonia consumption is very similar to level observed in the early 1970s. Similar to nitrogen solutions, urea as steadily increased over the five decades of data. Figure 3. 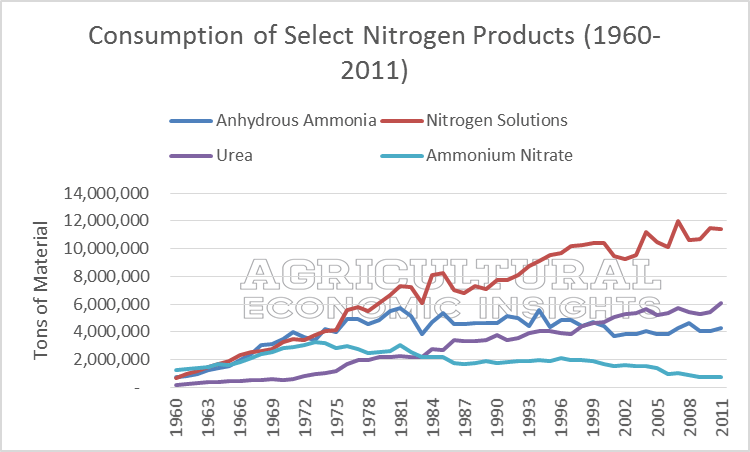 Tons of Production Consumption for Select Nitrogen Products (1960-2011). An important consideration in the source of nitrogen a producer uses is the price. In figure 4, the price per pound of nitrogen for three nitrogen sources (anhydrous ammonia, urea, and 28% liquid nitrogen) are shown from 2010-2016. These data are collected for Illinois and reported by USDA AMS. 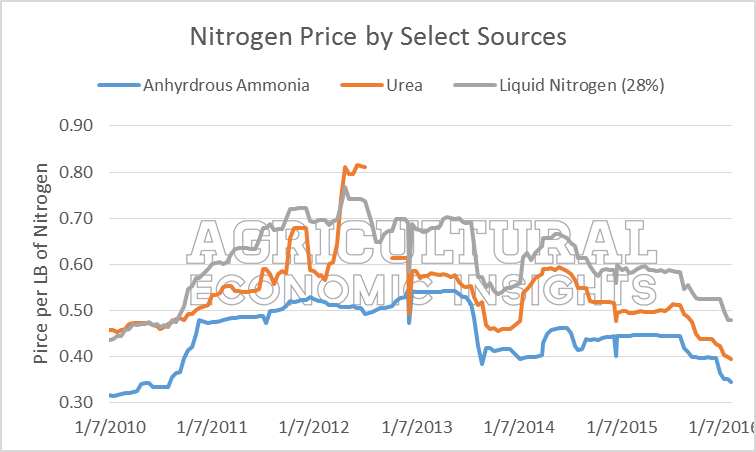 The unit price ($ per pound of nitrogen) for the three sources have trended lower since 2012. Urea prices are at the lowest levels in the six years of data. Anhydrous ammonia and 28% are near low levels, but not at low as they were in early 2010. Anhydrous ammonia was priced at $0.32 per pound of nitrogen in early 2010 and is currently priced at $0.34. The fact that urea is at historically low levels while anhydrous ammonia and 28% are still off those lows highlights the importance of the price relationship between the nitrogen sources. 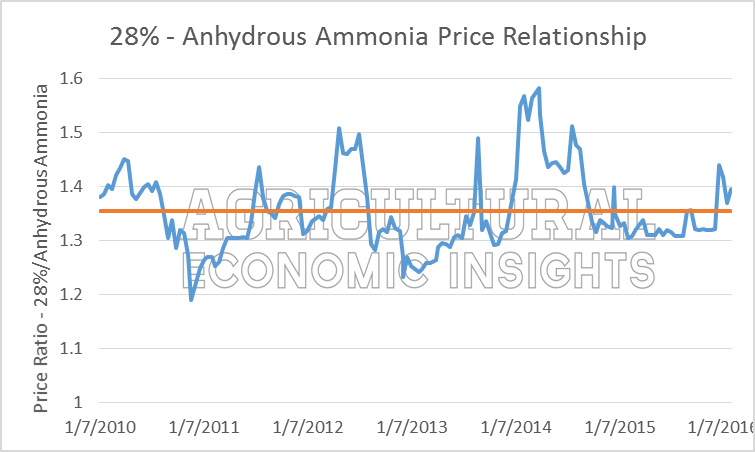 In figure 5 the relationship between urea and anhydrous ammonia prices are shown. Over the previous six years, urea was, on average, 1.21 times the price of anhydrous ammonia (in orange). This average price ratio is almost never observed as the ratio is quite volatile and can be well above or below the six-year average. Currently, urea is relatively cheap to anhydrous ammonia at 1.15 times the price. In previous years, urea has only occasionally been priced below 1.10 times the price of anhydrous ammonia. In figure 6 the price relationship between 28% and anhydrous ammonia is shown. On average, the price of 28% is 1.35 times the price of anhydrous ammonia. Current 28% prices are 1.39 times the price of anhydrous ammonia. As recently as August of 2015 28% solution as as low as 1.30 times the price of anhydrous ammonia . 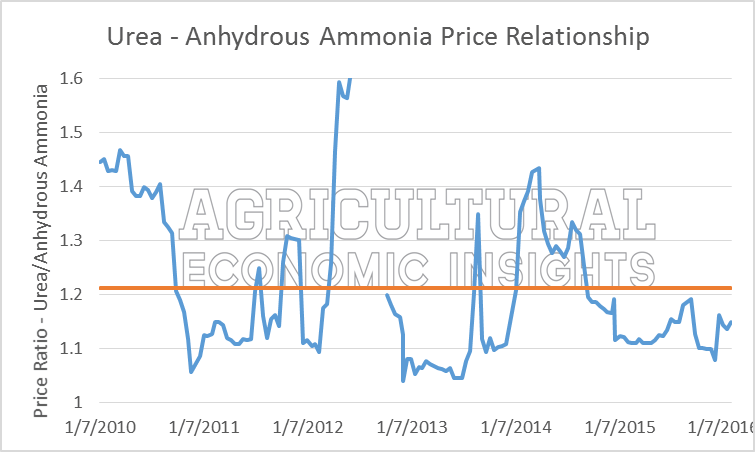 Overall, anhydrous ammonia prices this past fall and winter have fallen faster than 28%. Throughout the fall and winter we’ve been providing updates on fertilizer prices as published by the USDA for Illinois. Overall, fertilizer prices have continued lower since and are 15% to 25% lower than prices observed last spring. Potash has declined the most with DAP price decreasing the least. The impacts of these price declines are significant. For example, a producer using anhydrous ammonia and applying 175-70-70 units of nitrogen, phosphorous, and potash would notice fertilizer expense nearly $32 per acre lower than last spring. These are significant, but by themselves are not enough to restore economic profitability. Figure 7. 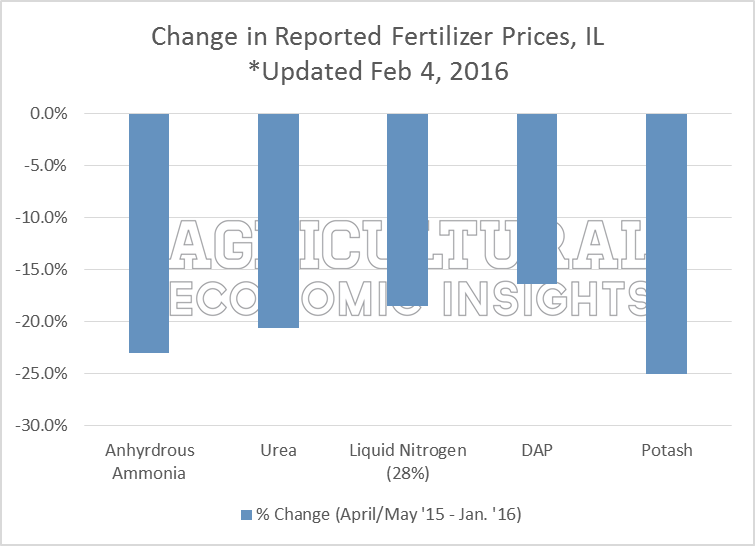 Change in IL Fertilizer Prices. February 2016 compared to April-May 2015. Nitrogen fertilizer is an important input for corn production. Over time, the sources of nitrogen fertilizer has shifted in the U.S. While anhydrous ammonia usage has remained mostly flat since the 1970s, nitrogen solution and urea has expanded while ammonium nitrate has contracted. The price relationship between the nitrogen products has varied considerably over time. Currently, urea prices appear low relative to anhydrous ammonia. Conversely, the relationship between 28% and anhydrous ammonia suggest 28% is relatively pricier than average. Overall, fertilizer price have continued lower. The exact magnitude at which prices have declined depends on the specific product, but all have seen substantial declines since the Spring of 2015.As we noted in a earlier post, fertilizer prices are still above their long-run average prices.